Internationally recognized, Washington, D.C. artist, Renée Stout is renowned for mixed-media installations based on conjure and other black folklife practices, voodoo and African traditions. Her prints, drawings and mixed media installations have been exhibited in the U.S., England, Russia and the Netherlands. She was awarded the High Museum's David C. Driskell Prize in 2010. The Driskell Prize is an annual award that recognizes a scholar or artist in the beginning or middle of his or her career whose work makes an original and important contribution to the field of African American art or art history. The artist came to national prominence with the show Black Art, Ancestral Legacy: The African Impulse in African American Art, which opened at the Dallas Museum of Art in 1989. 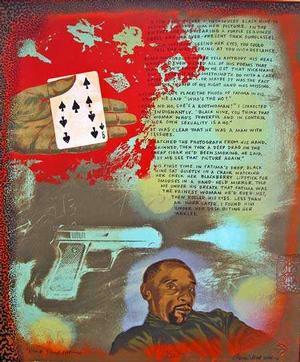 The exhibition facilitated the development of a new visual vocabulary that both connected contemporary African American artists to their African ancestry, and exuded mystical and magical expressions. Many remember her work, Fetish #2, 1988, a sculpture that introduced her to national attention. Her most recent art exhibition, Renée Stout: Tales of the Conjure Woman, on view at The Katzen Arts Center, American University, Washington, DC (January 23-March 13) and previously at the Ruth & Elmer Wellin Museum of Art, Hamilton College (October 3 - December 20, 2015), draws extensively on the artist’s engagement with earlier themes in her career especially as the artist shared with author, “…the continuing need for self-discovery and the need to understand and make sense of human motives and the way we relate and respond to each other." Tales of the Conjure Woman consists of assemblages, installations, tableaux, vibrant paintings, drawings, prints, and photographs, all employed in the creation of several complex narratives that, at times, feature characters conceived by the artist to underscore her fascination with and embrace for the magic of conjure. Hoodoo is most commonly defined as beliefs or customs brought to America by enslaved Africans that were mingled with the beliefs, customs, and botanical knowledge of indigenous Americans and with the Christian, Jewish, and pagan folklore of European immigrants. Hoodoo, conjure, and rootwork are magical systems found throughout the world in countries in South America, Africa, Europe, the Caribbean Islands, and here in the United States particularly in Louisiana, and the Gullah communities of the Sea Islands of South Carolina. Stout was born in Junction City, Kansas in 1958. Her father was stationed at nearby Fort Riley during his two-year military service. Upon his discharge, Stout’s parents returned to Pittsburgh, Pennsylvania, their hometown. Stout’s sister, Lauren, was born two years later in Pittsburgh. Renée grew up in comfortable middle class circumstances. Her father worked for her grandfather who owned a hauling business, “Stout & Sons.” Years later he opened his own business, demolishing buildings. Her mother worked as an attorney’s assistant. Her parents were interested in the education of their children, providing them with educational toys, books, and involving them in creative after-school programs. Both Stout and her sister were artistically inclined but Lauren became a judge in Stockton, California. 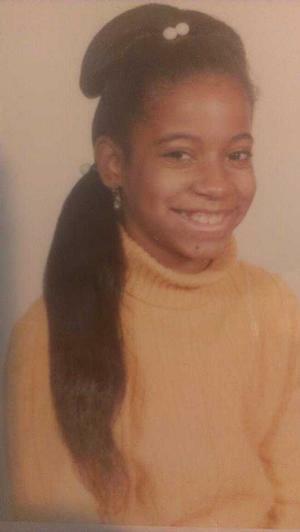 Renée graduated from a scholar’s honors program in high school. Her parents expected that she would become an engineer and were surprised when she decided to major in art at Carnegie Mellon University. Her early interest in art was cultivated by a fourth grade teacher who showed her Edward Hopper paintings. She was struck by the sense of mystery, stark urbanity and the simplicity of palette in Hopper works such as Nighthawks. Aspects of Hopper’s stylistic approach to painting appeared in Stout’s realistic cityscapes when she was a student at Carnegie Mellon University. One of these early paintings is Hangin’ Out (1983). Here Stout utilizes a stylized brush stroke and bright colors. 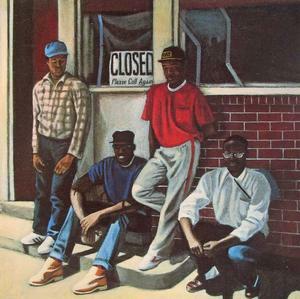 Her composition, like a photographic snapshot, is a close up of a group of young men hanging out in their neighborhood. What proves disquieting is the cleanliness of the street, the young men are well dressed, the part of the building we see looks as if it is in good condition. How are we to read this painting? There is a sign in the door that reads: “Closed please call again.” Is the shop temporarily closed or gone out of business? Are these four neatly dressed young men out of work or just friends hanging out on the weekend? Do we assume them among the urban poor on first view rather than merely a group of affluent guys hangin? Why? At the time Stout was becoming aware of the paintings of Ralph Goings, Robert Cottingham and Richard Estes photographic realists who focus on the geometry of cities. In Maull (1985), we can see how Stout translates Estes’ geometric sensibility into her own work. Here too she pulls in for a close up in her composition, creating a photorealistic or pop style painting. The objects are placed extremely close to the frame of the canvas. 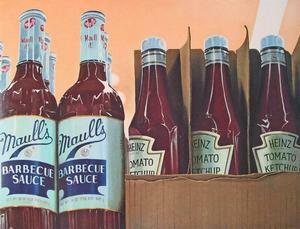 The bottles of barbecue sauce and ketchup stand side by side like soldiers to emphasize the contrast between the horizontal and vertical directions and the cylindrical and square shapes. Earlier, in 1983, three years after graduating Carnegie Mellon, Stout and a fellow artist, Jacqueline Jordan, had moved to Boston to begin a six-month residency at Northeastern University. The African-American Master Artist-in-Residency Program (AAMARP) created by Dana Chandler, Jr, in 1977, was intended to bring diversity to the university community by including artists of African heritage whose work and potential embodied excellence. Northeastern was the first university in the country to provide an in-residence program for African American artists and the program is still in existence. At the time, Boston was a polarized city due to a federal busing program designed to desegregate the public schools. Although they were living in a campus building, Stout and Jordan felt the hostility that resonated throughout the city. The racism was palpable causing Stout to become more introspective. She stopped painting cityscapes and turned to constructing boxes. The boxes were a natural development . The summer before arriving in Boston, Stout had become interested in the work of Joseph Cornell and Betye Saar. Their assemblages provided a language that enabled her to translate her thoughts in a new mode. Rethinking the meaning of houses, Stout determined that these structures were receptacles for family secrets and experiences. Instead of painting them, she could construct them. She began collecting ‘things’—found objects, natural objects, and scraps. Her early boxes became metaphors for the isolation and marginalization she was feeling in Boston. In 1985 Stout moved to Washington, D.C. She had a friend there, Dean Dalton, who offered her an opportunity to stay in his condo until she found her own place. Stout knew she needed to live in a city that fed her creativity with museums and art galleries. One day, while visiting the Smithsonian’s National Museum of African Art, she became reacquainted with the Minkisi sculptures, figures that she first saw at the Carnegie Museum of Art in Pittsburgh as a little girl. Building on her understanding of Cornell’s and Saar’s art in studying the Minkisi figures, Stout began to conceive of the possibilities of object-based art incorporating allusions to magic, mystery, and ritual. The following year, Stout contacted a Pittsburgh woman had a family that owned a house in D.C. that they were selling. It was a two-story house with large rooms in a neighborhood near Howard University. The woman offered Stout the opportunity to live in the house until it was sold provided she would care for the woman’s brother who had Downs Syndrome. The brother had a regular routine; Stout’s responsibility would be to fix his meals. For the next six months, Stout had a place to live with a studio and a job working in a thrift shop. She later got a position with an after school program that paid more money. She kept the job for four years (1986-1990). The money she earned from this job enabled her to rent an apartment once the house was sold, sometime in 1987. Meanwhile, Stout continued to connect concepts based upon the Minkisi figures with the art of Betye Saar. 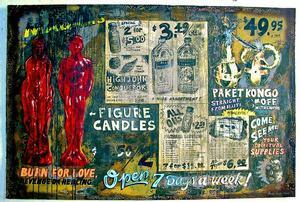 The narratives of Saar’s assemblages focused on the African American woman. Saar challenged the stereotypes of African American females and explored her own personal life. Stout revisited her perceptions of the house. It was not just a receptacle for family secrets, Stout saw it as a metaphor for the self. The early boxes were simple, house-shaped objects in which she placed feathers, beadwork, tiny bones, buttons, and memorabilia of family members. Gradually, her shadow boxes began to grow and transform into free standing sculptures and tableaux that paid homage the Minkisi figures. For the next several years she stopped painting and focused on these figures. 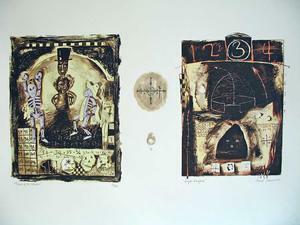 Stout’s creative muse continued to engage the possibilities of hoodoo and rootwork; mysticism and noir secrets; when she realized her now defining Fetish #2 which became a standout in the Black Art – Ancestral Legacy exhibition (1989) previously noted. One of the curators working on that exhibit was art historian Regenia Perry, who first became familiar with Stout’s work at the Marie Martin Gallery in Washington, D.C. and encouraged her inclusion in the exhibition. Black Art... was a major exhibition consisting of over 20 artists – both trained and untrained. The intent of the show was to identify how modern artists were drawing heavily on African influence, while simultaneously reinterpreting it for a different time and place according to exhibition materials. The show became a landmark exhibition and Stout’s Fetish #2 became the iconic symbol of the exhibit. Stout was the youngest and artist in the exhibition. Her art appeared on television, in newspapers and art magazines. The exhibition attracted the attention of curators and brought national recognition. In Fetish #2, Stout transformed the male attributes of the warrior/hunter to ones of femaleness, intentionality and visual maleness from the warrior/hunter to one of femaleness, sensuality, beauty and sexuality. In 1993, her work appeared in a one-person show curated by Wyatt MacGaffey, an African specialist and Michael Harris, an art historian of both African and African American art. The Eyes of Understanding: Kongo Minkisi and the Art of Renée Stout exhibition juxtaposed Stout’s creations with actual Minkisi figures. Her mother and sister drove down from Pittsburgh to visit her and see the exhibition. Her father, who had warned her against pursuing a career in art was pleased with her success and told her, “(I’m) glad you didn’t listen to me. I am glad you followed your own heart.” The exhibition brought her work international attention. By the time Stout was in her thirties she was involved in a personal journey of self-discovery. Her parents had divorced, but remained friends. They later remarried but continue to live separately. During this period Stout created an alter-ego, Madame Ching, a figure that functioned as a conduit to act out inner needs and desires and to overcome her shyness. Madame Ching would be clear about who she was, how she wanted to be treated and speak up to power. Madame Ching was based upon a woman who lived in a row house in Pittsburgh's Hill District, the birthplace of August Wilson and the setting for many of his plays. Stout often walked down these streets and saw the sign in one of the windows that read: Madame Ching. Madame Ching never spoke as you passed her sitting on her front stoop, she would just stare. There was mystery surrounding her and according to people in the neighborhood, she was rumored to know how to "work roots." With the introduction of Madame Ching, Stout began experimenting with her installation work adding narratives. In 1993, Madame Ching appeared in Traveling Root Store #2: Madame Ching Goes High Tech. In the work, Stout pits a vintage doctor’s bag, vials, and herbs against Madame Ching’s new-age custom computer with computer keys altered to assist her need to reach the deities. By the time Stout was 40, she had become Madame Ching. She was forthright and able to speak her mind. She continues to also explore her sexuality and her femininity. Stout recalls that her father had wanted sons and as one method for appeasing her father she suppressed her femininity. But as an older wiser woman, she was like most African American women, looking to define herself for herself. She wanted an alternative presence that was aggressive, sassy, and bold. Fatima appears in this current exhibition; her fingerprints are everywhere — written messages, photographs, paintings and roots. Works included in this exhibition include, The Rootworker’s Worktable. The mixed-media instillation offers an eye level view of Fatima’s magic; the work explores the manipulation of the supernatural. 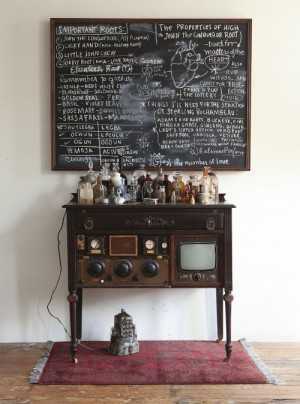 Above the table is the painting made to look like a chalk board, with a list of roots, the properties of the heart, a list of important gods, and so much more. Below, on the table are bottles of powders, roots, and other natural objects. Within the table, itself, there are knobs, a screen, and navigation arrows. Under the table is a "generator" created by Stout. All of which, stand on a purple rug. 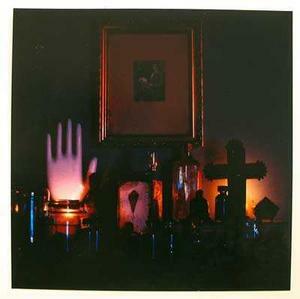 The magic of the work is that for all the specific information provided, conjuring still remains a mystery. In 1991 Stout won the Pollock-Krasner Foundation Award. She also is the recipient of the NMWA Library Fellows Artist’s Book Award (2008), in collaboration with poet Carol Beane for the book, The Streets of Used to Be; and the Driskell prize (noted above). As the curator and scholar, Michael Shapiro noted, “Renée Stout is a visual artist fully incorporating available resources to create works relevant to both past and present.” Her work is at once delicate and powerful, revealing and mysterious. Her works leans back to an African aesthetic and forward to a contemporary visual language.